Rob Nelson '71, left, with former New York Yankee Jim Bouton, in a photo that ran in Sports Illustrated in April 1990. The photo appeared with an article titled "By Gum! Still Pitching at 40" about Nelson, Bouton and their creation of Big League Chew. Photo by Lane Stewart/Sports Illustrated/Getty Images. Author Jonathan Swift stated: "Discovery consists of seeing what everybody has seen and thinking what nobody else has thought." For former Cornell baseball pitcher Rob Nelson '71, his discovery involved seeing two ballpark staples -- chewing gum and chewing tobacco -- and thinking of a way to combine the two into a new product that has stood the test of time for 30 years: Big League Chew. Nelson had his best season with the Big Red as a senior, going 6-2, with his only losses coming against Big 10 champion Michigan State and EIBL champion Harvard. 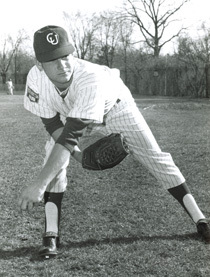 Following graduation from Cornell with a degree in philosophy and after earning a master's in education at SUNY Cortland, Nelson pitched for a few years in South Africa and in 1977 found himself pitching with the Portland Mavericks, an independent Class A minor league baseball team that was made up primarily of has-beens and never-weres. One of his fellow pitchers was 38-year-old Jim Bouton, a former New York Yankee and author of the wildly popular book "Ball Four," charting his experiences with the 1969 Seattle Pilots (that team's only operating season). One evening, the two pitchers watched in disgust as some of their younger teammates tried to spit tobacco juice on each others' white cleats. Rob Nelson pitches for the Cornell Big Red in 1970. Seeing Bouton's reaction, Nelson shared an idea that had stemmed from childhood. Nelson's nickname was Nellie, and he was a fan of Hall of Famer Nellie Fox, one of many ballplayers that kept a large wad of chewing tobacco in his mouth while he played. Nelson had often emulated his hero with a log of Bazooka bubble gum. "I told him, 'I always thought it would be cool to have shredded gum so we could look as good as these guys, but not get ill,' says Nelson. "I remember Bouton's eyes got really big, and he said 'Jeez, I really like that idea.' I like to say that I had the inspiration, but truth is, Jim was the perspiration because he was really the guy that did the bulk of the work. He said, 'I can sell that idea.' ... And on a handshake, we became partners." Bouton's enthusiasm was one thing, but it took the work of Dan Chernoff, B.E.E. '57, LL.B. '59, a patent and trademark lawyer, to ensure that Big League Chew would have a future. Nelson had met Chernoff that summer at a Cornell Club of Portland cocktail hour. "Dan said that we couldn't patent [the idea], but we could certainly protect it with trademarks and copyrights and so forth," says Nelson. "And Dan was absolutely right." One obstacle remained: Neither Nelson nor Bouton knew how to make gum. Coincidentally, Nelson stumbled upon an article in January 1979 in People magazine about do-it-yourself bubble gum kits. He purchased a case and set about making several batches of gum. "[We] cut it with scissors, bought chewing tobacco pouches, put the gum inside, put my picture on the pouch and called it Big League Chew," Bouton recalled in a recent Chicago Tribune article. Amurol Products, a subsidiary of Wrigley, sold $18 million of Big League Chew gum wholesale in its first year. 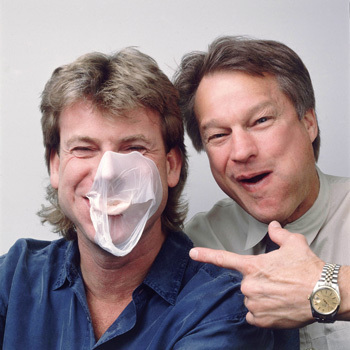 With the product in hand, the pair went to all the major gum companies, using Bouton's clout to get in the door, but most were reluctant to try a product so unique. Finally, Amurol Products, a subsidiary of the Wm. Wrigley Jr. Co., introduced Big League Chew in 1980. Amurol sold $18 million of Big League Chew at wholesale that first year, a number that well exceeded Nelson's wildest dreams. "I was over the moon," he says. "I remember telling my brother Ed, 'At least now I won't have to paint houses in the summer.' I thought I was going to have a teaching job and coach baseball somewhere. So then to think that I wouldn't have to work in the summer because I might make $25,000 or $30,000 extra with the little bubble gum idea was a dream. Then it turned out to be 10 times that!" As Big League Chew spread into Little League dugouts across the country, Nelson continued to pitch all over the world. 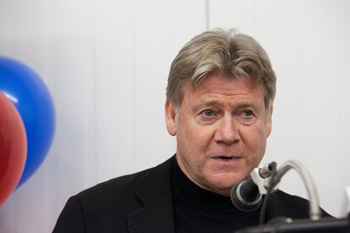 With Big League Chew paying his bills, Nelson was able to continue playing into his early 50s in places such as South Africa, Australia and England. 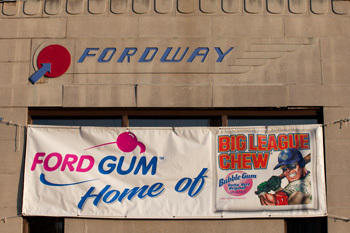 The addition of Big League Chew to Ford Gum and Machine's production lines added 20 jobs to the western New York plant. Eventually, Wrigley absorbed Amurol, and Nelson bought out Bouton, but neither of those changes was nearly as significant as when Mars Inc. purchased Wrigley in 2008. "I could see the writing on the wall that a small brand like mine wasn't going to be a priority," explains Nelson. So he managed to get out of his contract with Wrigley a year early. Nelson wanted to move production back to the United States (in recent years it had been manufactured in Mexico) so he purchased the gum shredding and packaging machines from Wrigley and discovered the small company Ford Gum and Machine, based in Akron, N.Y. The addition of Big League Chew has brought roughly 20 new jobs to the western New York plant and will increase Ford's production by about 40 percent. A ceremony marking the gum's addition to the company was held Nov. 8. Nelson speaks at a ribbon-cutting ceremony marking the addition of Big League Chew to Akron, N.Y.-based Ford Gum and Machine Nov. 8. 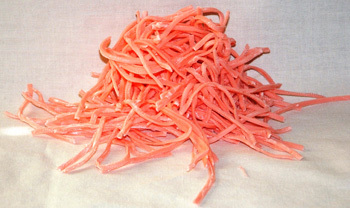 The addition of the gum was expected to increase Ford Gum's overall production by 40 percent. Other than the new venture with Ford Gum, Nelson spends his days with small projects and inventions, as well as devoting his time to his wife, Sarah, and children, 11-year-old Paige and 7-year-old twins Charlie and Jane. He has plans to take a trip this spring with several friends to Princeton, N.J., to celebrate the 40th anniversary of one of his greatest collegiate triumphs -- when he led Cornell to a 2-0 victory, pitching a two-hitter against the Tigers. He also wants to do something for Cornell and the baseball program that was so instrumental in getting him where he is today. "Right now, I'm the unofficial gum of Cornell baseball," says Nelson. "But I would love to really help the program and pay tribute to [former] coach Ted Thoren. I would love for the bullpen to be the Big League Chew bullpen and have a plaque out there that says 'Rob Nelson threw here once; briefly and ineffectively.' Something that would be playful but show my gratitude to the university."